The sudden death of North Korean leader Kim Jong Il drives home the importance of being able to work not only with U.S. allies but also with China in managing Asia’s key threats. This is what makes striking the right balance in America’s overall strategy toward Asia so vital. The Obama administration’s overall posture toward Asia has in fact evolved considerably over the course of the past couple of years. President Barack Obama laid out the result in its fullest form last month, as he traveled to Honolulu, Australia, and Indonesia for a series of major meetings. The message of this remarkable trip warrants careful examination, as it articulated an integrated diplomatic, military, and economic strategy that stretches from the Indian subcontinent through Northeast Asia — and one that can profoundly shape the U.S.-China relationship. The core message: America is going to play a leadership role in Asia for decades to come. The U.S. media portrayed this message as directed solely at confronting China in Asia, but it is in fact much more complex than that. How realistic is the strategy the president articulated, and how is it likely to affect U.S.-China relations and the roles of both countries in Asia? Does America have the resources to make good on the rhetoric concerning this historic “pivot”? Obama came into office as avowedly “the first Pacific president,” convinced that George W. Bush’s administration had paid too little attention to Asian regional issues and that the United States should restore and then enhance its traditional level of engagement there. Efforts accelerated as China’s Asia policy became more hard edged during 2010 and as, during 2011, the United States’ military involvement in Iraq and Afghanistan significantly declined. Especially during 2010, the United States did not hesitate to respond to Chinese heavy-handedness in the region. In reaction to North Korea’s test of a nuclear device and then launch of deadly provocations against the South, the Obama administration unequivocally supported Seoul, pressured China strongly to rein in Pyongyang, and against China’s strong objections carried out naval exercises in the Yellow Sea to serve as a warning to North Korea. In these and other instances, during 2010 the United States made discrete responses to various Chinese initiatives that were seen as potentially leveraging China’s economic power to achieve diplomatic and security gains in the region. These responses were combined with very active bilateral U.S.-China diplomacy to keep the U.S.-China relationship on track and to manage expectations on both sides. A successful state visit for Chinese President Hu Jintao in Washington in January 2011 indicated that this combination of firmness on defined issues and active bilateral diplomacy had left the bilateral U.S.-China relationship on reasonably solid footing. Multilateral organizations. Over the past decade China invested substantial efforts in the Association of Southeast Asian Nations (ASEAN), the ASEAN+3 (ASEAN, plus China, Japan, and South Korea), and the ASEAN Regional Forum (ARF). 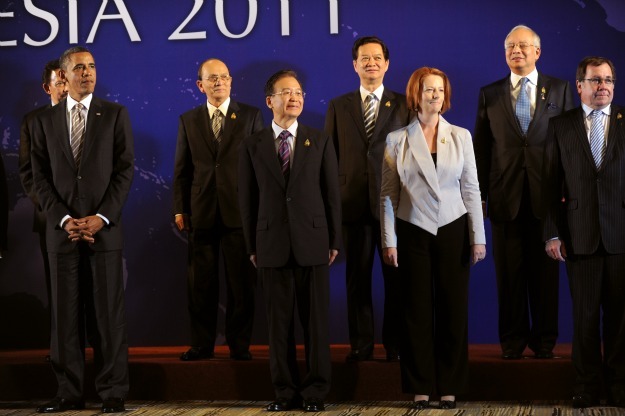 Beijing negotiated a free trade agreement with ASEAN that provided for generous “early harvest” measures in the mid-2000s; the full agreement came into effect in 2010. This agreement, of course, excluded the United States. Beijing also supported the ARF as the key regional security forum, possibly because the ARF had demonstrated over many years that it would operate wholly by consensus and would not take up difficult specific issues. Against this background, Obama in November 2011 brought to fruition his decisions to support decisively two different multilateral organizations. On the economic and trade side, the president declared that America hopes by December 2012 to see the Trans-Pacific Partnership (TPP), now being negotiated, become a high-quality trade and investment platform that will include the major economies of the Asia-Pacific. The TPP is being structured around principles America champions in terms of transparency, protection of intellectual property, labor rights, environmental protection, and so forth (these could be considered to be “WTO plus”). While Obama noted that all who accept its principles will be welcome to join, the TPP principles differ greatly from those that guide most Chinese actions in the economic and trade arena. China is not among the initial group of countries negotiating to establish the TPP. On the security side, America formally joined the East Asia Summit (EAS), and Obama used his inaugural participation to steer this new body toward focusing on difficult, concrete security issues in the region, especially maritime security. This was not at all to Beijing’s liking, but most EAS participants supported the overall American approach. Economics and trade. The Obama administration had a disappointing record on trade issues during its first two-and-a-half years in office. But in early November 2011 it finally achieved ratification of the free trade agreement with South Korea, and it then, as noted above, turned its focus to developing the TPP as a new trade and investment platform in the Asia-Pacific. This pair of initiatives has thrust Asia back into the center of U.S. economic and trade initiatives, in line with Obama’s oft-repeated assertion that there is no region as vital as Asia to America’s future economic prosperity. All this came amid rising economic and trade tensions with China — tensions that are unlikely to subside during the coming year of electoral politics in Washington and succession politics in Beijing. Security. Obama declared unequivocally on this trip that he will protect America’s Asian security investments from any future cutbacks in overall U.S. military spending. In Australia, moreover, he signed an agreement to allow rotational deployments of 2,500 marines in Darwin. Following a trip by new Defense Secretary Leon Panetta a few weeks earlier to the region, the president left no doubt that the U.S. military and broader security focus was now shifting from Iraq and Afghanistan to Asia and that this new posture will remain at the top of America’s security priorities and will be protected from any future defense cuts. Democracy. A global democracy agenda had not been a prominent part of Obama’s tenure, but this changed significantly with the 2011 Arab Spring. The president made clear on this trip that America will lead in Asia in promoting democracy and human rights, declaring in Australia that, “Other models have been tried and they have failed — fascism and communism, rule by one man and rule by committee. And they failed for the same simple reason: They ignore the ultimate source of power and legitimacy — the will of the people.” At his final stop, Obama announced that Hillary Clinton would visit Burma (Myanmar) in early December — the first U.S. secretary of state in 50 years to do so — to take the temperature of new reformist stirrings there and encourage progress toward more democratic governance. The new comprehensive strategy, in short, elevated the democratic component of American diplomacy in Asia. Most of the specific initiatives unveiled on the president’s November 2011 trip had their antecedents in 2010 or before. But whereas previously the United States selectively pushed back when it objected to Chinese actions and focused great attention on managing the overall U.S.-China relationship, the November trip marked a significant shift. Washington is still very much focused on sustaining a constructive U.S.-China relationship, but it has now brought disparate elements together in a strategically integrated fashion that explicitly affirms and promises to sustain American leadership throughout Asia for the foreseeable future. China, not surprisingly, is worried about these new developments. They in many ways reinforce China’s abiding suspicions about the United States. In Chinese eyes, the United States has always been concerned primarily with protecting its own global dominance — which perforce means doing everything it can to retard or disrupt China’s rise. That America lost its stride in the global financial crisis and the weak recovery since then while China in 2010 became the world’s second-largest economy has only increased Beijing’s concerns about Washington’s determination to postpone the day when China inevitably surpasses the United States to become the world’s most powerful country. Beijing, for example, sees basically hostile American efforts in the following spheres: promoting dissent in China in order to create instability that America can then fan via cyber activities into upheaval that will bring down the Chinese Communist Party’s rule; pressing China to revalue its currency so as to increase destabilizing unemployment in China and direct Americans’ attention away from the United States’ own failures; creating problems for China by fanning fears about Beijing’s intentions among its neighbors and encouraging those, such as Vietnam, that have traditionally harbored deep suspicions of Chinese ambitions; forging cooperation among countries — especially the major democracies — in Asia to create obstacles to China’s achieving its rightful role as the major power in the region; challenging China’s model of development as an alternative to the tarnished Western democratic model; and using measures such as the formation of the TPP to reduce the scope for internationalization of the renminbi, which China thinks is an important step in reining in America’s abuse of the dollar’s role as the global reserve currency. In sum, the president’s Asia-wide strategy and some of the rhetoric accompanying it played directly into the perception of many Chinese that all American actions are a conspiracy to hold down or actually disrupt China’s rise. China’s leaders retain enough respect for American strength and capabilities that Obama’s self-assured declaration of America’s ongoing leadership role in Asia — backed by ample evidence of comprehensive U.S. strategic thinking and diplomacy — has at the same time at least raised the unwelcome possibility for Beijing of a significantly new context for China’s own regional strategy. The American press portrayed the Obama trip as affirming American leadership of Asia, challenging and trumping China at every turn. The fact that the United States’ initiatives apparently received warm vocal support from nearly all major countries at the East Asia Summit reinforced this perception. But the reality is more complex, both as to what the president sought to do and as to the likely results. In these private meetings the spirit has been one of explaining each side’s positions in terms of more than formal talking points in order to gain mutual understanding and increase mutual trust. The starting point has been mutual respect and recognition of the deep interconnected interests between China and the United States. These closed-door discussions have thus been designed to lessen the chances of unnecessary Sino-U.S. hostility. This quiet dimension of bilateral diplomacy seeks to manage U.S.-China tensions going forward and to set the tone and agenda for the many regular U.S.-China meetings across the two governments throughout the course of any given year. China’s responses. China was by all accounts surprised at the scope and detail of the Americantour de force in November. Its initial reaction has been mild, possibly in part because of private assurances received during meetings between the top leaders and also in part because of the political succession this coming year in Beijing. The Hu leadership wants to avoid any serious deterioration in U.S.-China relations and very likely does not want to generate a major internal review of U.S.-China relations during this very sensitive political year. However, China’s leaders also do not want to fall seriously behind popular nationalist sentiment if that sentiment mushrooms over perceived American efforts to prevent a rising China from assuming its rightful place in Asia. This sentiment could increase pressure on the national leadership to push back against the assertion of America primacy in China’s own backyard and to remind the United States of the changing real balance of power in Asia. Possibilities include, inter alia, escalation of tensions in general, reduced cooperation on issues such as sanctions against Iran and dealing with the unfolding succession in North Korea, and increased incidents in China’s exclusive economic zone, none of which can be ruled out. Each can produce its own escalation of friction and distrust in U.S.-China relations. The military’s role in Chinese politics is very murky but could also factor into these responses during this succession year. The Chinese succession thus can potentially move the situation in either direction, depending on internal dynamics there. Preventing a turn for the worse will require active, sustained, and carefully calibrated American diplomatic efforts. Internal administration shift. There is a relevant internal administration dynamic at play that is more difficult to pin down but may prove consequential. The Obama administration’s China policy from its earliest days was shaped especially by the close cooperation between Deputy Secretary of State James B. Steinberg and the senior director for East Asia on the National Security Council, Jeffrey Bader. These were the first two top officials dealing with China to be in place in 2009, and they developed very effective cooperation to maintain the leadership of the White House especially on China but also on related broader Asian policies. From late 2009 onward, there was a different strand of thinking in the State Department, supported by some in the Pentagon, that sought a tougher stance toward China and was more prepared to warn others in the region to be worried about China’s growing capabilities and to band together to constrain Chinese initiatives. These two streams of policy were not in sharp conflict, but each side sought consciously to shape overall American policy and often proffered different tactical advice as various issues arose. Messrs. Steinberg and Bader left the government in the spring of 2011. With their departures, there is no China specialist at the level of bureau chief or above at the State Department, the National Security Council, or the Pentagon. The White House briefing provided to journalists before the president’s departure on his Asia trip more fully embraced the rhetoric (such as declaring an American “pivot” to Asia) and approach of those in the State Department who have sought a tougher line than at any time previously in the Obama administration. If this change in personnel has produced a substantive change in White House policy, that can prove to be a very significant development over time as new issues arise. American credibility. A tougher line may in fact produce more constructive Chinese behavior if it convinces Beijing that America retains the capacity to lead in Asia over the long run and is willing to encourage China’s ongoing development so long as that does not produce behavior that challenges America’s overall position or vital interests in the region. China’s leaders are, after all, very pragmatic. They are unlikely to “take on” the United States if America has adopted a strategically coherent Asia strategy that is widely respected and viewed as credible in the region. In this context, it is striking that Obama and Clinton talked in Asia as if Asians did not view the global financial crisis as “made in America,” as if the American system of democracy has recently been performing splendidly, and as if the American military had all the resources necessary to sustain any type of deployment Washington wishes across the vast Pacific region. But none of these is true. The biggest question in Asia is whether America will bounce back from its current fiscal crisis and soon get onto a path to fiscal health and future strength. The political meltdown over raising the debt ceiling in August 2011 did enormous damage to America’s standing in Asia because it generated such a strong negative signal on exactly this issue. As the president was laying out his strategy toward Asia in November, the congressional “supercommittee” was failing to reach even a minimal agreement to present to the Congress as a whole — a failure that was announced within days of the president’s return to Washington. There thus may have been more than a little wishful thinking in the president’s rhetoric during his November trip. While the president indicated that all countries would be welcome to join in Asian prosperity if they accepted the high standards being developed for the TPP, the reality is that at present it is China and not the United States that is the largest trade partner for every major economy in the region, and China does not operate according to these standards. No Asian country appears willing to do anything to jeopardize its economic ties with the rapidly growing Chinese economy, especially at a time of weak American growth and a very uncertain economic prognosis for Europe. The U.S. military, moreover, is facing potential total budget reductions of over $1 trillion over the coming 10 years. Most Asian governments wonder whether this will, despite current protestations, adversely affect American military capabilities — and the United States’ willingness to use them — in Asia. China’s military, far weaker than that of the United States, appears set to enjoy double-digit annual budget increases for years to come. China’s trajectory. There is also the matter of China’s own prospects. There is an impression when discussing Beijing’s international role that China’s growth momentum is unstoppable and that its system is on very firm ground domestically. But both of these are in fact in question. Beijing has already made clear that it must change its development model, as the model that has proved so successful in the past few decades has run its course and is now increasingly generating outcomes — extreme disparities in wealth, pervasive problems in product and food safety, increasing corruption, catastrophic environmental degradation, decreasing returns to investment, widespread feeling that the system itself has become unfair, and so forth — that are economically unsustainable and socially destabilizing. But there is sparse evidence to give confidence that the very tough political decisions required to effect this change — decisions that will challenge vested interests in the corporate world and among some powerful local leaders — will in fact be made during this time of succession politics in Beijing. Indeed, the protracted nature of the succession warrants pessimism about substantial domestic reforms before about 2014, if then. Yet, China’s political stability cannot be assured without the types of changes in the political system that have become very difficult — perhaps too difficult — to make. Should China experience major political unrest or a sharp disruption in its growth momentum, perceptions throughout the Asia-Pacific will shift in ways that can easily affect attitudes toward China’s role and the U.S.-China balance in the region. The declaration of America’s strategic pivot to Asia announced in November clearly sought to generate confidence in America’s future leadership role in this region and respect for Washington’s capacity to orchestrate this very impressive diplomatic tour de force. Many in Asia have been worrying about American decline. Obama projected American optimism, principles, determination, and leadership. This strategy has substantial potential benefits, but it is not nearly as certain a trumpet as the president and Secretary Clinton made it sound. Most importantly, the United States will not have the resources and capacity to fully meet the president’s promises unless it addresses its domestic fiscal and related political problems far more effectively than recent experiences suggest is likely. Putting America’s domestic house in order is a necessary condition for the success of the new Asia strategy. In addition, the Chinese may respond in increasingly challenging ways, especially as their domestic politics intrude. The United States had been responding to entreaties from its friends and allies in Asia by taking actions primarily on the diplomatic and security side until well into 2011. This ran the immediate risk that some countries, such as Vietnam and the Philippines, might succeed in dragging the United States into their own territorial disputes with China, a situation that Washington had wisely taken care to avoid in the past. More fundamentally, this broad approach ran the longer-term risk that Asia will increasingly become a cost center for the United States (providing security is expensive), while the region will continue to serve as a growing profit center for China (due to its vast economic engagement). Given America’s fiscal plight, that is not a comforting or possibly even a sustainable trajectory. The Obama administration’s pivot to Asia prospectively establishes a more balanced economic, diplomatic, and security approach. The recent U.S.-Korea Free Trade Agreement ratification and efforts to create the TPP are very important steps in this direction. But this new integrated Asia strategy risks overreach by creating expectations that Washington will not be able to meet, feeding suspicions in China that may lead to a far more irascible U.S.-China relationship, and assuming goals among other Asian countries that miss their more complex perceptions of American prospects and strategies in the region. Indeed, both the United States and China must keep in mind that they are best served by adopting positions that engender a healthy respect in the other capital concerning capabilities and goals so that neither acts rashly and both have strong incentives to cooperate where possible. As of now, it is too soon to tell whether Obama’s November trip has laid the basis for a truly more balanced, sustainable strategy in Asia.